One of my favorite parts of this month's Stamp of the Month is the adorable sentiments. That's why I decided to fill two parts of this week's Atlantic Hearts Sketch Challenge sketch with this sweet two part sentiment. 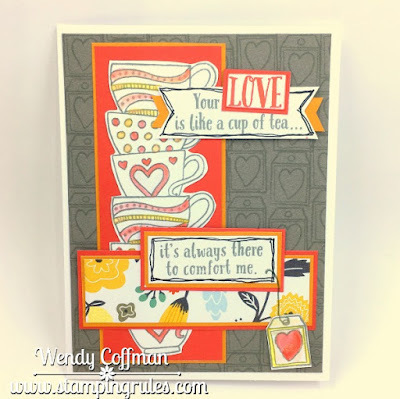 Drawing my colors from the Dreamin' Big papers as suggested in this week's Heart 2 Heart challenge, I filled the Slate cardstock background with the teabag label image using Whisper ink. I used Slate and Poppy inks to stamp the sentiments and cups. There are only three teacups in the image, so I used a post-it to mask off the top cup so I could stack those teacups higher! I filled in a few details with Poppy and Goldrush inks using my trusty waterbrush, and then I went over those details with a gold shimmer brush. I like this one because the gold shimmer is suspended in a clear medium instead of yellow tinted. I'm making a bunch of these for my team swap next weekend. I hope you'll pop over to Atlantic Hearts and play along with us this week! Fabulous Card! Thanks for sharing with us at Heart2Heart! I love the background stamping, so slight but impactful. I also love the colours used, great choices! Thank you for playing along with Heart 2 Heart Challenges (H2H)! 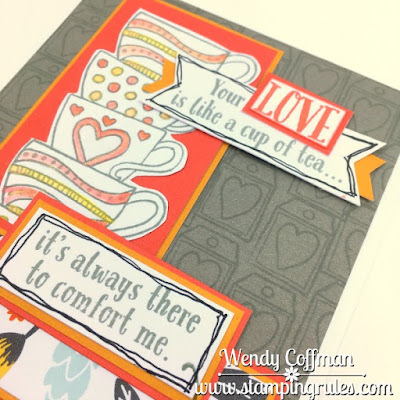 What a gorgeous card- I love the background stamping and how you have highlighted the word Love. Thanks for joining us at H2H Challenges.